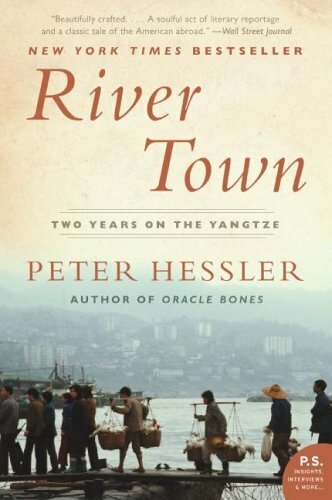 In 1996, at the age of twenty-seven, Peter Hessler joined the third group of Peace Corps volunteers to work in China. Along with Adam Meier, another young volunteer, he was sent to teach in Fuling, a small city at the junction of the Wu and Yangtze rivers, in Sichuan province. At that time, Fuling felt remote — there was no highway or railroad, and in order to reach Chongqing, the nearest big city, residents usually took the eight-hour river boat. For most of Hessler and Meier’s first year, they were the only foreign residents in Fuling. But there was a strong intimation of future change: downstream, the government was constructing the Three Gorges Dam, the largest dam in the world, which would radically transform the landscape and towns like Fuling. Some of their [the foreign teachers’] teaching methods are acceptable … We should affirm their achievements. But sometimes they also make some students embarassed due to their absence of Chinese custom. We Chinese have our own taboos. . . . . When I was writing my composition, someone shouted at the classes: “Pete and Adam are playing Frisbee!” At once, I put down my pen and rushed out the classroom. Really, they are! … The two sports men stood far away from Frisbee each other and began to play. How wonderful it looked! The Frisbee was like a red fire, flying person to person between the two men. I have seen it for a long time. Foreigners are so versatile. River Town tells the story — sometimes funny, sometimes sad, often inspiring — of this contact between American teachers and Chinese students and residents in a small city. The learning process went both ways: while Hessler was teaching English and American literature, he was also studying Mandarin Chinese and trying to understand his new home. He happened to arrive in Fuling just as the nation’s economic boom was gathering steam, and he saw how locals responded to momentous national events: the death of Deng Xiaoping in early 1997, and the return of Hong Kong to China later that year. But in Fuling the history that mattered most occurred at the personal level: a farm boy feverishly learning English with the hope of leaving the countryside forever; an entrepreneur with a small family restaurant, dreaming of buying a car; a young woman deciding to head off alone and seek her fortune in distant Shenzhen. These are the heroes of River Town, and their stories are told against the backdrop of the two rivers and a beautiful, ancient landscape. The Yangtze is peopled – it has been channeled, prodded, diverted, dammed; buoys mark its shallows and boats of all sizes crest its polluted waters. It goes to Shanghai. The Wu – clear, green, lightly travelled – comes from the mountains. One river is all about origin; the other, destination: this is what defines the difference in their personalities. The Yangtze in its size and majesty seems to be going somewhere important, while the Wu in its narrow swiftness seems to have come from someplace wild and mysterious; and the faint forms of its distant hills suggest that the river will keep its secrets. You can fish all day long and the Wu will give you nothing.